At Just White Dental, we offer a broad range of dental solutions to suit your needs. 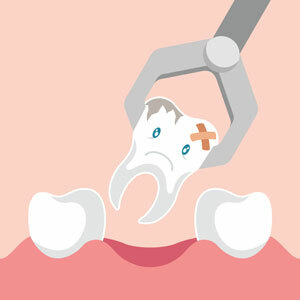 If a tooth has been damaged by decay or trauma, we will make every attempt to save it with options like a root canal treatment or the placement of a crown. When necessary, however, we can gently perform an extraction that’s completely pain-free. Once we’ve determined that an extraction is required for your situation, we’ll review your medical history. There are certain conditions that indicate a higher risk of infection happening. If needed, we will prescribe antibiotics that can be taken before starting on treatment. When you arrive for your appointment, we’ll begin with taking X-rays of the affected area. Then, we can plan how best to proceed with the removal. A numbing gel will be applied to the area followed by a local anaesthetic to leave you numb and completely comfortable. We’ll check to be certain that you don’t feel any pain before we continue. After the removal has been completed, the area will be packed securely with gauze. You’ll bite down to apply pressure and the process will be completed. We’ll detail the proper aftercare instructions, which can also be found below. We offer same-day appointments. If you’d like immediate attention or have a dental emergency, we’ll make every effort to get you in as quickly as possible. Late opening hours are available that fit easily into your busy schedule. Contact us today to learn more about extractions and wisdom teeth in West Ryde!